Factoid #31. Who was David MacLaren? He was one of the people who passed through Richmond in the early years but he was also much more. A Richmond merchant of the 1820s, members of MacLaren’s family went on to become very wealthy entrepreneurs. Born in Scotland, MacLaren came to Richmond with his wife and 3 small sons. An ironmonger and hardware merchant, MacLaren’s skills would have been much in demand. There is little mention of his time in the village. On March 14, 1822, the Rev. William Bell of Perth visited Richmond and wrote in his Journal that he dined with Mr. McLaren (MacLaren). On May 26th of the next year, David MacLaren was the first to sign a petition asking the government for land for a Presbyterian church and rectory. It’s not clear where MacLaren’s store may have been. However in 1834 he received the Land Patents (deeds) for two pieces of land – one acre on the northwest corner of Burke St. and Lennox St. and ten acres (park lot 14) south of Queen St. at the end of Murray. Some time, probably in the late 1820s, he acquired land in Torbolton Township and began to farm near the Ottawa River. After 1840 the family moved again – this time to Wakefield Quebec. In 1844 David lent money to two of his sons, John and James, who purchased and updated a gristmill. The MacLaren family replicated the endeavours of George Lyon in Richmond – they built a sawmill and woolen mill and opened a store. To their good fortune the fast moving water of the Gatineau River and its tributary provided the power that had eluded Lyon with his mills on the unreliable Jock. 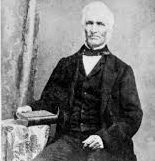 David’s son, James, expanded his interests to include a lumber mill in Buckingham and he became one of the famous lumber barons of Ottawa in the 1860s. In the 1880s he was considered one of the richest men in Canada and had a variety of investments including: railways, banking, mining and iron works. 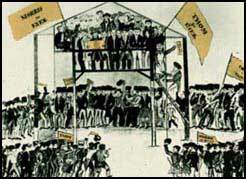 However, lumber remained the backbone of his business and James employed 500 people in Buckingham. He later expanded his various timber industries to the United States. His estate was estimated to be worth 5 million dollars in 1892 when he died. Richmond had lost an enterprising family. Factoid #32. At a recent meeting of the GTHS, Larry Cotton, author of a series of books, Whiskey and Wickedness, claimed that the soldier/settlers’ were dependent on beer and whiskey, and that Richmond was a production centre for both. There certainly seems to be a basis for his assertion. Historian Andrew Haydon outlined that in the 1820s Richmond had four breweries. One brewer was Col. George Burke. After his job as Superintendent disappeared, in Dec.1822, Burke was looking for alternate sources of income and one possibility was to start a brewery. This was not necessarily an easy task as shown by this letter he wrote to Philemon Wright on March 30th 1824. “My man whom I sent to Saint Andrews (Quebec) for the purpose of bringing up a Steam Boiler for my brewery was obliged yesterday morning by the breakup of the ice (on the Ottawa River) to leave it 3 or 4 miles below Hull…. I am now under the necessity of soliciting your assistance as it is of material consequence my getting it up before the land road breaks… and will most willingly pay any expence (expense) attending it. It is about 11 or 12 feet long and weighs 9 to 11 Cwts.”(Hundredweights). It is not clear whether this was Burke’s first attempt to establish a brewery. In a memoir written after he left Richmond, (transcribed by George Neville in an unpublished article) Burke described the commissary. “The store built by the Government 40 x 30 of round logs and one floor laid. I have relaid the ground floor, laid an upper floor, and fitted up works in it as a Brewery, at an expence [sic] of upwards of £250.” He said that this was the way the building looked by the end of 1818, but in the description he outlined modifications that he had made. Why was he making these changes to a new building? Did the 1818 supply depot become the site of his 1824 brewery? It is unknown. Regardless, these are examples of how early in the life of the new village breweries were established. But where did the brewers get the ingredients for their product? It is doubtful that in the first few years of the village there was extra grain to use for brewing. A possibility was that the brewers made beer that did not include grain. Gareth Newfield in his article “Drink Up! Alcohol and the British Soldier in the Canada’s During the War of 1812”, points out that the soldiers were used to drinking spruce beer when conventional beer was not available. Spruce beer was not popular but it only required three ingredients: spruce, molasses, and yeast. Spruce and yeast could be acquired locally and George Lyon was importing molasses. In 1821 he purchased almost 30 gallons from his Montreal suppliers and that amount doubled the next year. We don’t know if other merchants were also bringing molasses to the village. Grain production increased and George Lyon opened his gristmill in 1825. There would have been excess grain for the breweries. Then in 1829, Lyon imported 400 pounds of hops from Montreal. More conventional beer was being produced. When settlers first arrived they received a location ticket. During the time of the Military Settlement these were issued to both soldiers and civilians by Superintendent Burke and were free. After Dec.1822 this function was taken over by the civilian government. By this time much of the Crown land in Goulbourn and Richmond had been allocated. There were terms associated with settlement including building a house and clearing some land. The terms of settlement usually took about three years. The settler could then apply for a Patent. It often took another two to three years for the provincial bureaucracy to process an application before it was finally approved. Stanzell outlines the various steps – thirteen in all – which occurred between the initial application being received in the Executive Council Office and the Patent being issued. Many different departments were involved. This system was problematic for many setters. Why? Some setters were illiterate; others had medical or money problems, which made it impossible to fulfill the terms of settlement. Col. Burke worked to ensure that the soldier/ settlers received their Land Patents as soon as possible and many were issued by 1822. This was important not only to the soldiers but also to Burke himself since only landowners could vote and he had political aspirations. Elections in the period before 1840 were dominated by the Richmond elite and their friends. Although some of the elections were hard fought and acrimonious the combatants were usually Tories. Both Richmond and Perth were part of the District of Bathurst. From 1824-1828 Col. George Burke represented the district but he did not contest the election of 1828. Both candidates were Perth Lawyers – James Boulton and Thomas Radenhurst. Radenhust was the brother in law of George Lyon and had the support of all the Richmond leaders. These elections were very different from ours. There was only one polling station and that location was often in a tavern. The Richmond elite usually succeeded in placing the polling station in their village. The voting took place over a number of days (usually 5); it occurred in public and an elector had to state his choice in front of the other voters. Candidates plied voters with food and alcohol. Fights often broke out among rival factions as men were persuaded to, or deterred from, voting for a specific candidate. Vote buying was common and candidates paid the outstanding debts of voters. A letter from Hamnett Pinhey to Col. James FitzGibbon in 1832 outlined Pinhey’s behaviour in the election of 1830. Captain John Lewis had been behind in a contest against Thomas Radenhurst. Pinhey went to Richmond to help Lewis. “I hired a private room & table at the Inn in the village for my private convenience, which you will readily believe from the prominent part I took was not long private. I advanced money to some of the farmers to clear themselves from his (Lewis’s) opponents ….” as well voters were promised work contracts or location tickets (the right to acquire a specific piece of land). Lyon also tells Radenhurst that he must get deeds to any landowners entitled to them. “It will be indispensable necessary for you to … get the deeds of those who are entitled sent down to me where I can make use of all the advantages the circumstances (and I) will admit of and must say this is a point of paramount importance.” The electoral system had room to develop! Factoid #35. Every successful community has more than political elites and merchants, it also has its clerks, tradesmen and labourers who underpin daily life. One person who bridged these two groups in early Richmond was Garrett (Garret) Fitzgerald. Born in Limerick, he was one of the few Roman Catholic soldiers who settled in the village. Discharged with the rank of Sergeant, Fitzgerald had joined the 100th Regiment in 1805 at the age of 14. A labourer when he joined, Fitzgerald became a trusted clerk and when he came to the village he distributed supplies from the commissary from 1818-1822. This paid him a wage of two shillings a day. The 1822 census shows him as a head of household accompanied by his wife and three children. His daughter, Mary Ann, born Feb. 15 1819 is said to be the first female born in the village. Fitzgerald joined the Carleton Militia in 1821 and held the rank of Sergeant Major. In the same year, according to “Richmond 150”, he was the Senior Warden and Andrew Hill the Junior Warden in a newly formed group of Freemasons. He later became Master of the lodge. He was a clerk of the Army Pension Board at Richmond and later clerk of the Second Division Court until 1848. The Day Book for the Lyon Store gives us some insight into the lifestyle of the Fitzgerald family from June 1844 to Feb. 1845. The Day Book only records those items that were bought on credit. His wife and daughter frequently accompanied Fitzgerald when he visited the store. What did they buy? Major items included soap and starch, nails and screws, stovepipes, and cotton material in mostly dark colours. On special occasions the family bought spices currants, fish and meat. On the lighter side was their first purchase – a bull’s eye. At a time when most of Lyon’s customers bought whiskey, tobacco, sugar and tea, Fitzgerald purchased neither whiskey nor tobacco. The family did buy tea on a regular basis but only acquired 2 pounds of brown sugar. In 1847 Fitzgerald made a new land purchase, and bought the one-acre lot on the northeast corner of Lennox St. and Hamilton St. from John B. Lewis. The 1850 census shows that his family lived in a one storey sided log house. When Richmond became an incorporated village in 1850, Fitzgerald was the first clerk but only until 1853 and once again he disappears. The 1860 census shows his wife, Elizabeth, a widow. It now seems as if there was much more to the life of Garrett Fitzgerald than that of a simple clerk. Hopefully more information will surface as research continues. This entry was posted in document, Events, industry, Personalities. Bookmark the permalink. Great piece of research, Marion, on the MacLaren connections to Richmond, Wakefield, and later Buckingham. Several new facts have been added to the biography of Garrett Fitzgerald since it was posted.